The award-winning Peugeot 3008 SUV. Pictured from left to right: Irish Car of The Year Committee member, David Walshe; Irish Car of The Year Committee member, Michael Sheridan; Managing Director at Gowan Distributors Limited, Peugeot Importers in Ireland, Des Cannon; Tom Dennigan, Continental Tyres. 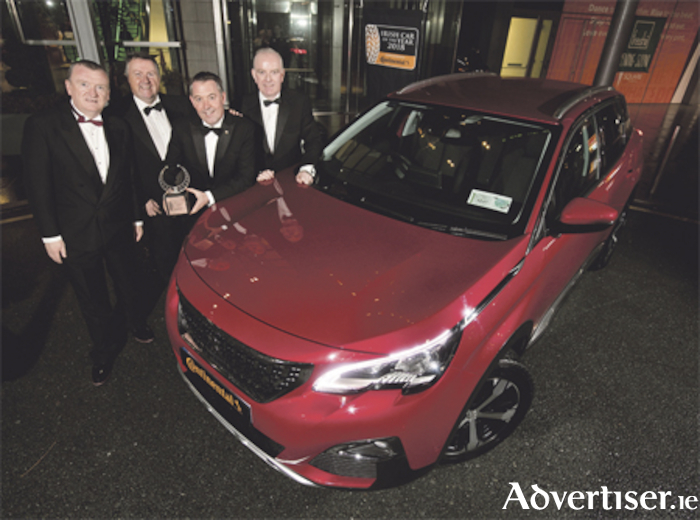 The new Peugeot 3008 SUV was crowned Irish Car of the Year 2018, in association with Continental Tyres, at a gala event in The Gibson Hotel, Dublin, attended by leading figures in the Irish motor Industry and motoring journalists. Awarded the Irish Compact SUV of the Year 2018 category winner, the 3008 SUV then beat off stiff competition from eight other category winners to take the overall title crown. Launched in March in Ireland, demand for the multi-award winning Peugeot 3008 SUV has soared to place it as the best-selling Peugeot car model in 2017. The Irish Car of the Year 2018 accolade is the 34th international award bestowed upon the 3008 SUV. Call Hugo Loonam Motors on (090 ) 6457104 for more information or to learn more about the great range of Peugeot motors on offer.